Passionate to take Basic Gk Quiz? Thereby aspirants should go through this page and learn more interesting things about General Knowledge Topic. Also, check some tips on how to crack various competitive examination in a simple manner. Most of the students will say that they are weak in GK Quiz. So, Basic GK Quiz Questions and Answers page might be very useful for those aspirants. The below test is similar to the Basic GK Online Test that will provide you the detail information of the General Knowledge and also the Basic GK Questions. This article will help to polish your unawareness about General Knowledge. Thereby take the entire reading of this article that contains Basic GK Questions and Answers that make you practice and then you can start your test. 1. Which crop is sown on the largest area in India? 6. Who among the following were contemporaries of Kanishka? 9. Areas of which of the following current states did not come under control of Vijayanagar emperor Krishnadeva Raya? 10. Which one of the following was the first fort constructed by the British in India? 11. Which country below is not one of the members of the UN security council (Jan 2003)? 12. What is the second largest country (in size) in the world? 13. Which language is spoken in Karnataka? 14. Ball pen function on which one of the following principal? 17. Which of the following countries is not a part of Melanesia region in the pacific ocean? 18. Which country has recently joined Euro Zone as the 18th member? 20. For which of the following disciplines is Nobel Prize awarded? 21. What is the world's most common religion? 24. Who was the Prime Minister of India when the 42nd Amendment Bill bringing in the changes in the Constitution was passed? General Knowledge purpose is mainly to study and know the current affairs at present that are involved around you. Everyone should have perfect awareness about the general knowledge as it is essential for the memory ability and can know what is going on around us. Moreover, learning General Knowledge will help in cultural ability and also increases memory ability. As the society nowadays is not so supportive, so we individually should have awareness about the concept of learning current affairs. Meanwhile, it will give you effort and prepares you very strong facing any sought of difficulties. Similarly by learning this General Knowledge will help you to the growth personally as well as in academic level. Without having minimum knowledge of Basic GK you cannot survive properly. Within the short time, candidates can get a glance at the concept. 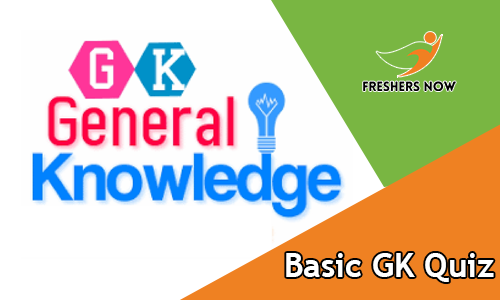 As it is very important to learn about Basic Gk, helps you to attempt any competitive exams simply. Keeping ourselves with the best general knowledge is very important in the development of personal growth. Aspirants can enhance their skills about current affairs, and also the General Knowledge topic. The results are given based on the correct answers to the questions provided. So, we suggest the candidates to, keep an eye on our website freshersnow.com for more details.